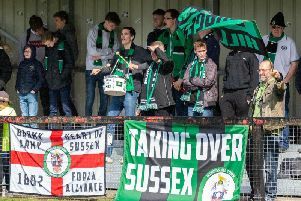 Bognor drew 2-2 in their Bostik premier opener at Haringey. After a goalless first half Jimmy Muitt gave the Rocks the lead early in the second before Borough hir back with two goals in eight minutes from Joel Nouble and Karl Akinwande to lead 2-1. A David Olufemi sown goal 18 minutes from time rescued a point for the Rocks, who gave debuts to Archie Edwards, Dan Smith and Harvey Sparks. In the FA Cup, Chichester City lead at Bearsted through a Dan Hegarty header but lost 2-1, with the hosts scoring the winner in injury time. That's the third year in a row City have gone out at the first hurdle. Pagham were also in Kent to face K Sports and came away with a 2-2 draw, their goals scored by Johan van Driel and Dan Simmonds. The sides will replay on Tuesday at Nyetimber Lane. In the Peter Bentley Cup Midhurst had a fine 4-1 at Oakwood courtesy of goals by Bradley Miles, Liam Dreckmann, (2) and Grant Radmore and Selsey beat Billingshurst 4-0 at the High Street Ground with Harry Gregory, Oli Hambleton and Josh Hall (2) scoring. But Sidlesham are out after a 4-1 loss at Steyning.